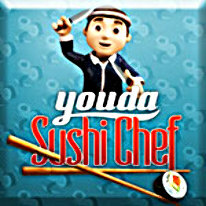 Youda Sushi Chef is a fun time management game. Your main goal is to keep your customers happy, well fed and serve them the right dishes in time to reach your daily target. You really have to rely on your memory skills. Extra features like reservations and take away orders coming in constantly keep your adrenaline going. To keep your customers happy you can decorate your restaurants, perform great knife tricks or serve some sake while your customers are waiting. The game consists of six beautifully designed restaurants, a great choice of different sushi recipes, lots of bonuses, combos and upgrades. Whoda Sushi Chef? Youda Sushi Chef!